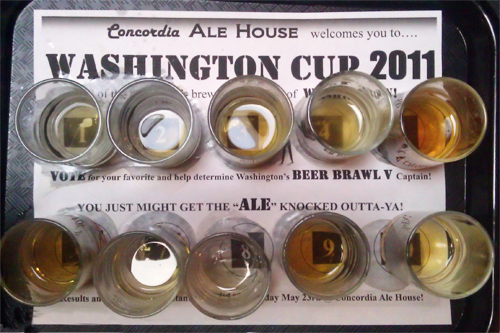 I have never been to a brawl, let alone a Beer Brawl, so I decided to head over to Concordia Ale House for the start of their Washington Cup to see what it was all about. I knew there would be some sort of judging, and of course drinking, so I jumped on the opportunity of combining my two favorite hobbies. When I arrived, I was presented with a sample tray of ten numbered IPAs from Washington along with a scorecard. With just ten boxes, the scorecard was perfectly simple, allowing the drinker to pick one favorite. I had imagined the cup would be easy for me; that I would have a clear winner in my head. Boy was I wrong. The fact that all the samples were of one style made it pretty difficult to pick a winner, even more so, because the style was IPA. There were a few samples that had a lingering bitterness that not even the complimentary crackers could cure, making it hard to pick up on unique qualities of each beer. Imported from the great brewing state of Washington, all ten of these IPAs were above average beers, which also made it difficult to pick a champion. All ten of the sample brews were hand selected by the owners of the Ale House, in order to represent Washington's best IPAs. These are the cream of the crop, my friends. As I went through each sample, I scribbled down some notes about unique characteristics and gave each one my own rating 1-10, (10 being the best) so I could come back later and decide which would get my vote. The best score and my champion of the evening was #3. This IPA was perfectly crisp and not too carbonated like a couple others on the tray. At first, I was surprised by the malty sweet taste of this one, almost like a Brown Ale. It had a hoppy, citrus finish that made it a very balanced beer and all around delicious. Sample #4 came was my second favorite. This one was an ideal IPA, with the right amount of hops and tasty grapefruit and orange notes. However, this one seemed to be way too thick for my liking. This IPA probably would have been the winner if not for the carbonation overload. I want to drink beer, not champagne. I checked box 3 once the tray was sampled and handed my card into the bartender. So what happens now? Well, the votes get tallied after the final day of the brawl, Sunday, and the results are posted online. You can also provide your email on the scorecard to have the results sent to you. The champion brewery of the Washington Cup will select one of their brews along with 3 others—all different styles—from Washington to compete in Beer Brawl V in February 2012. The main event hosts 4 brews from each state, California, Oregon, and Washington, to compete for the grand champion spot. You have until this Sunday to vote for the best Washington IPA, so get your butts down to Concordia Ale House this weekend and stay tuned for the results of the challenge this Monday!